This track was released as a single in 2000. It was included in 2002 on the Park Records anthology Women in Folk . North America's “Maestro of Electric Folk” Jennifer Cutting, who masterminded the U.S.'s critically acclaimed electric folk band The New St. George, triumphantly breaks through th the international level under her own banner with her new single Forgiveness. Cutting assembled an all-star cast of legendary folk-rockers from both sides of the Atlantic for the recording sessions on the momentous day of August 11, 1999, when all of Britain waited breathlessly for the Total Eclipse of the Sun. While worldwide media swarmed the country and thousands flocked to Cornwall, Cutting's All-Stars watched the eclipse privately from the grounds of England's renowned Chipping Norton Studios, located in a quiet Cotswold village. Of the three songs recorded at Chipping Norton, Cutting has chosen Forgiveness as her first release of the new millennium, as both a hope for the new, and a celestial benediction for the old. Busy multi-Granny-winning guitarist/producer John Jennings (of Mary Chapin Carpenter fame) paid Cutting the ultimate compliment by flying all the way to England from his home near Washington D.C. just to play the sessions. His relationship with Cutting dates back to his involvement as producer for a few of the tracks of the New St. George's CD High Tea on the Folk Era label way back in 1992. Jennings brought into the fold legendary Fairport Convention drummer (and current Mary Chapin Carpenter bandmate) Dave Mattacks. One of England's greatest drummers (and the one who well nigh invented British folk-rock), Dave Mattacks can be heard on Richard Thompson's most recent album Mock Tudor, performing with the newest lineup of Steeleye span; and on Paul McCartney's new album Run Devil Run, recorded in Abbey Road Studios last year. The road to Forgiveness has been anything but easy. It took Cutting an unprecedented nine months to write the song, and another four years of planning to bring so many busy and celebrated musicians together under one roof for an international recording session. No stranger to patience, determination, and deferred gratification, she made her mark nationally by leading a group of local musicians on a ten-year journey from a basement practice room to North America's largest festival stages. But with the release of her first international recording Forgiveness, Cutting wins the admiration of the legends, and takes her place as a talent of word class. Forgiveness is available as a CD single from SunSign Records, or as an mp3 file from Riffage.com. 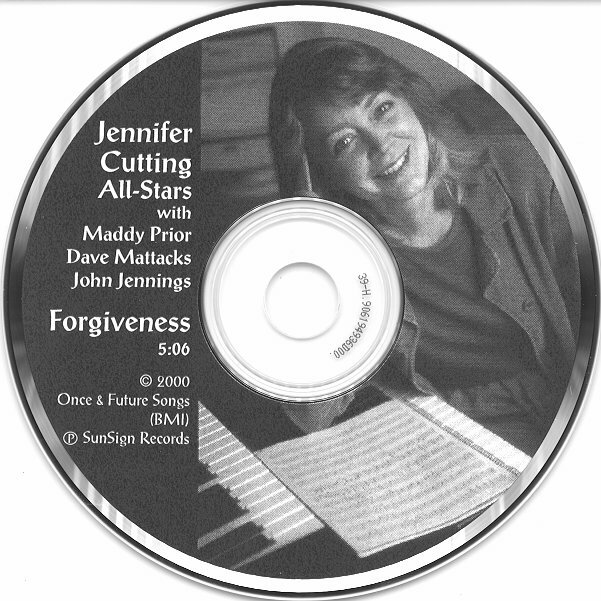 Find ordering links, photos of the sessions, and an audio preview of Forgiveness on the Jennifer Cutting web site.